Leading meteorological specialists, Biral, has just updated its four-page brochure covering the meteorological sensors benefiting the aviation market, to now include its thunderstorm detector. 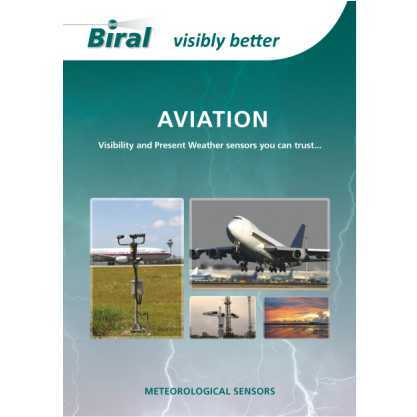 The new six-page Aviation brochure displays Biral’s best-selling forward scatter meters for the market, including the VPF and SWS Visibility and Present Weather Sensors and now with the addition of the BTD-300 range of thunderstorm detectors. The brochure shows how all of these can be used to aid the safety of airports, whilst complying with the stringent needs of ICAO. Biral recognises the importance of maintaining a safe and efficient operating environment, as air traffic is continuously increasing across the world. With unpredictable weather conditions in particular, it can often be difficult to plan and address issues which can lead to lengthy delays and cancellations. With the latest technology from Biral, accurate weather information is reported to give a clear indication of the current conditions and keep disruptions to a minimum. The brochure highlights the many ways in which Biral’s sensors are applied on airfields, including for Runway Visual Range (RVR) and aviation meteorological systems. The product application and configuration is adapted to give a solution that is suitable for the specific needs of each airport. Biral’s VPF and SWS Visibility and Present Weather sensors are designed to offer outstanding reliability and accuracy, with corrosion-resistant finishes to ensure the products are able to withstand the constant, challenging conditions on airfields. Coming in a compact package, the sensors can report visibilities from 10m to 75km, reporting back real-time results for an efficient process. Once installed the forward scatter meters require very little maintenance. Biral’s BTD-300 Thunderstorm Detector is a standalone sensor that reliably detects the presence of all forms of lightning to a range of 83 km. The unique quasi electrostatic operating principle gives the detector a very low false alarm rate and the ability to warn of the risk of overhead lightning. Virtually maintenance-free in operation, the BTD-300 can either interface directly to an integrated system or be operated using the supplied PC compatible display and logging software. The optional warning relay module allows the sensor to automatically sound whenever a storm approaches. In aviation applications, forward scatter meters such as Biral’s VPF and SWS sensors are a popular choice against transmissometers, which are considered to be particularly expensive and large in comparison. Biral’s forward scatter meters have proved to be suitable and reliable when faced with a range of conditions given their ability to efficiently detect the small particles of each condition. Studies have proved Biral’s forward scatter meters to be equally as successful as a traditional transmissometer in all applications, whilst offering significantly reduced system and installation costs.